The following procedures are listed for reference only to provide a general overview of the laser marking machine installation process. Refer to the laser marking machine Installation/Maintenance Manual for complete installation details. The following procedures are listed for reference only to provide a general overview of the Laser marking machine installation process. Refer to the laser marking machine Installation & Maintenance Manual for complete installation details. Do not connect any power cable to power source until all laser marking machine system connections are made. 1. All equipment must remain powered down and in OFF position until mounting is complete. 2. Place the laser controller, system computer, monitor, keyboard, and mouse in the desired locations. Locate the laser controller as close as practical to the laser marking head. 3. Ensure sufficient clearance exists on all sides of the laser controller to allow for proper air circulation and to permit proper installation of applicable cables. Refer to the Laser Marking Machine Controller Dimensions drawing for details. 4. Place the laser marking head on a suitable mounting surface. 5. Ensure sufficient clearance exists on all sides of the laser marking head to allow for proper air circulation and to permit proper installation of applicable cables. Refer to the Laser Marking Head Dimensions drawing for details. 6. Mount the laser marking head with three M5-0.80 bolts and lock washers using the factory-tapped mounting holes provided. Refer to the Laser Marking Head Dimensions drawing for details. Note: Optionally, three M6 locating pins may be used at the 0.2362 P6 hole locations for more precise marking head alignment. 7. Select proper fuse arrangement for the laser controller. Refer to the laser marking machine Installation & Maintenance Manual. 8. Connect all cables as applicable (fiber optic cable, laser marking head cable, RF cable, galvo control cable, computer monitor, keyboard, mouse, and power cables). 9. Connect any optional or customer-supplied devices or interface circuits as applicable. 10. Refer to the Operation Supplement for proper startup procedure. Refer to the Laser marking software Operating Instructions for complete information on using the system software. 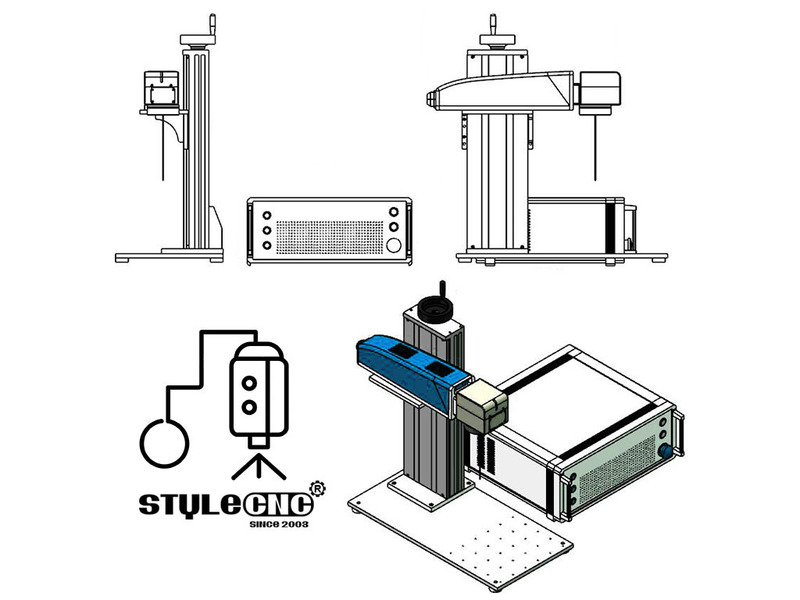 License: The text of "Laser marking machine system setup" by STYLECNC is licensed under a Creative Commons Attribution 4.0 International License. • Previous: What is a CNC router?